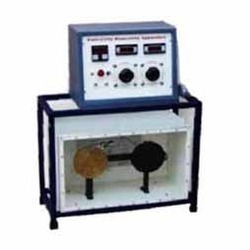 Our range of products include emissivity measurement apparatus for chemical industry. We are engaged in the business of Emissivity Measurement Apparatus for Chemical Industry. Hence the input difference will be due to difference in emissivity. Both plates are supported on individual brackets in a wooden enclosure with one side glass to ensure steady atmospheric conditions. Looking for Emissivity Measurement Apparatus for Chemical Industry ?